The figure below from a recent article in Nature is a rather puzzling observation. It shows a dramatic rise in the level of carbon 14 around 774 AD. The data was gathered from a couple of Japanese cedar trees. Because we can date the rings in these trees, we know their age, and by taking measurements of carbon 14 within each tree ring, we have a measure of how the levels varied year by year. 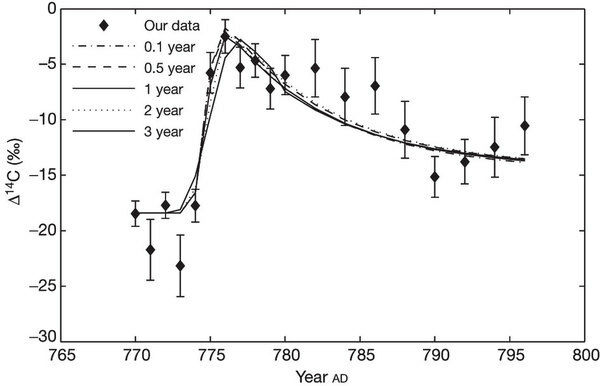 This spike in carbon 14 around 774 – 775 AD is huge (about a 20% increase) which makes its origin a bit of a mystery. You are probably familiar with carbon 14 as a way to determine the age of objects. This works because carbon 14 decays at a known rate into carbon 12, so by measuring the level of carbon 14 in some dead material we can determine how long it has been dead. This method works because living things constantly take in carbon through food and air while they are alive, and the level of carbon 14 in the atmosphere is constantly replenished by high energy astronomical events such as solar flares and cosmic rays. The level of carbon 14 in the atmosphere rises and falls over time, but it is generally pretty constant. A spike such as this one is unusual, and means that some very energetic astronomical event must have occurred around 774. So what could have caused such a large spike? The common cause of a carbon 14 spike is a solar flare. These occur on a fairly regular basis, which can cause a stream of high-energy particles to strike our atmosphere, creating things like the northern lights. They can also bombard nitrogen in our upper atmosphere with high-energy neutrons which creates carbon 14. The problem is that solar flares typically only produce a carbon increase of a few percent. This event is much, much larger than that, so it couldn’t have been caused by a solar flare. Suppose then that it was some huge solar flare, specifically what is known as a solar proton event. This is when a large solar flare or coronal mass ejection sends streams of high-energy protons our way. A spike of protons could produce a spike of carbon 14 when it interacts with our atmosphere. The problem with this idea is that unlike high-energy neutrons, high-energy protons are deflected by our magnetic field. Some protons can get through, but not most of them. So to create such a large rise in carbon 14, the solar proton event would have had to be huge. Really, really, huge. It would have been the largest solar event ever. We’ve seen such “super flares” on sunlike stars but never on the sun. And we’d know if one occurred because it would create tremendous northern lights, and it would even likely destroy much of the ozone layer resulting in mass extinctions. The year 774 is well within recorded history, and if such a super flare occurred, someone would have written about it. Nobody did. Another possibility is that it was caused by a supernova. A supernova produces gamma rays which can also generate carbon 14 when it strikes the atmosphere. The figure above actually compares the carbon 14 spike with an expected various lengths of gamma ray bombardments due to a supernova. The models seem to fit pretty well, so it would seem we have found our culprit. There’s just one problem. To create such a large spike, the supernova must have been closer than 6,500 light years, which is fairly close on astronomical scales. This means it would have easily been observed by historical astronomers. In 1006, a supernova occurred about 7,200 light years away, and it was observed in detail by Chinese and Arab astronomers. There’s no mention of a similar supernova just 230 years earlier. Such a supernova would also have a remnant that we could observe today, but nothing known seems to match. So the cause of this spike is unknown at the moment. We might be able to solve the mystery, however, by looking for similar spikes in other elements such as beryllium 10. We could also look further into historical data. For now, what we do know is that an astronomical event hit us pretty hard in the 8th century.